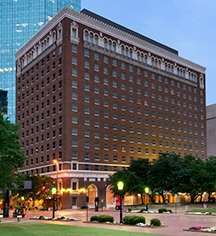 Originally the Hotel Texas, the historic Hilton Fort Worth is a legendary destination, immortalized as the location of 35th President John F Kennedy’s final address on the morning of November 22, 1963. Situated in downtown Fort Worth, this elegant Texas landmark is near significant cultural and historic attractions, including Sundance Square, The Fort Worth Cultural District, and the notable Stockyards Rodeo. Built in 1921, Hilton Fort Worth boasts 294 thoughtfully-appointed guestrooms and suites in a variety of layouts, refined dining experiences, from world-class steaks at Ruth's Chris Steakhouse to inventive cocktails at Skylight Court Bar, and over 25,000 sq ft of meeting and event space, including the iconic Grand Crystal Ballroom. 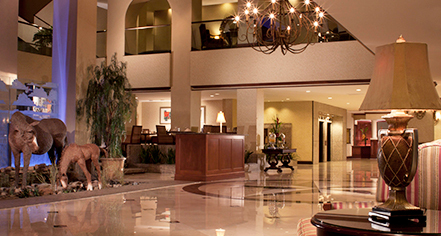 As one of the only hotels next to the Fort Worth Convention Center, Hilton Fort Worth offers business services and complimentary wireless Internet access throughout the hotel. Hilton Fort Worth, a member of Historic Hotels Worldwide since 2016, dates back to 1921. President Kennedy delivered his last address in the Crystal Ballroom, on November 22, 1963, just hours before his assassination in Dallas. Adjoining Rooms: Adjoining rooms are available. Please notify request at time of booking. Age Requirements: Guests are required to be 21 years or older with photo identification to reserve a room and check-in. Early Check-In/Late Check-Out: Early Departure Fee: $75.00 when checking out before your scheduled c/o day the guest is subj. to a fee Late Check-Out Fee: 1/2 day rental applies, or 50% of the rate paid. Parking: Self-parking: Not Available. Valet parking: $28.00 (Oversized $35+Tax). Secured: Available. Covered: Available. In/Out Privileges: Available. Payment: All forms of payment are accepted. Payment is required at time of booking. Visa, MasterCard, Amex, Diners Club, China Union Pay, Carte Blanche, Choice, and Discover are accepted. Originally the Hotel Texas, the historic Hilton Fort Worth is a legendary destination, immortalized as the location of 35th President John F Kennedy’s final address on the morning of November 22, 1963. Learn more about the History of Hilton Fort Worth .